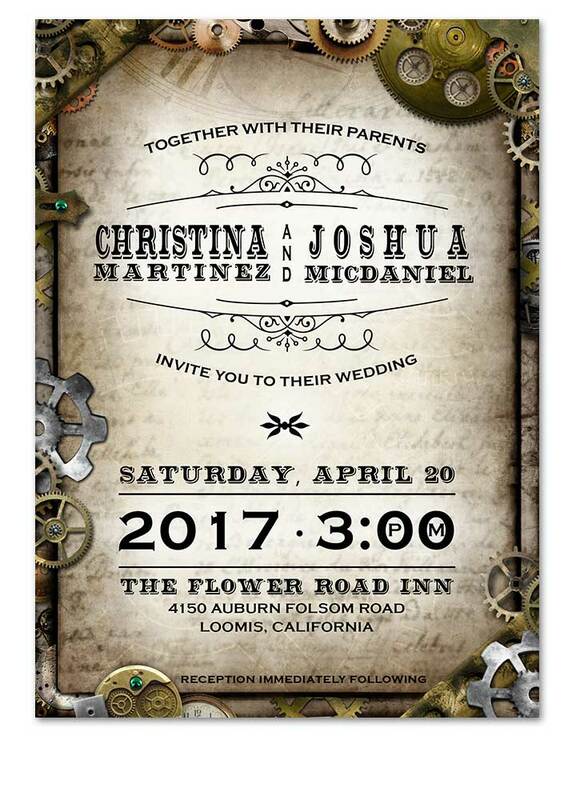 Show off your unique wedding style with our stunning Steampunk Gears Wedding Invitation. 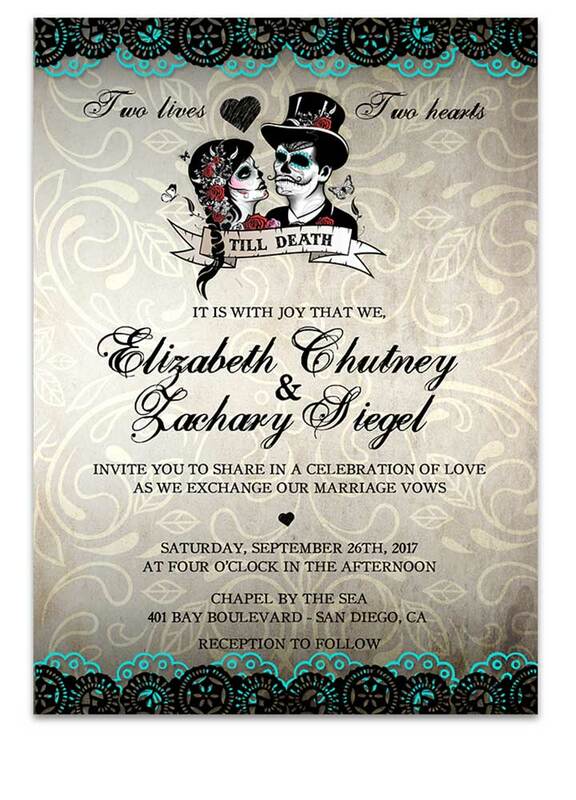 Sugar Skull Bride and Groom Wedding Invitation. Nothing will set the tone for your rustic-themed wedding quite like a vineyard invitation featuring chalkboard, lace and whimsical elements. 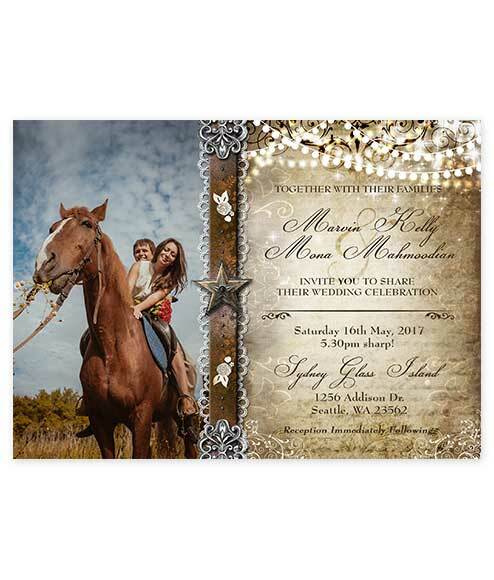 Showoff your rustic vintage country style with our photo invitation. This invite will create a memory that family and friends can hold onto for a lifetime. 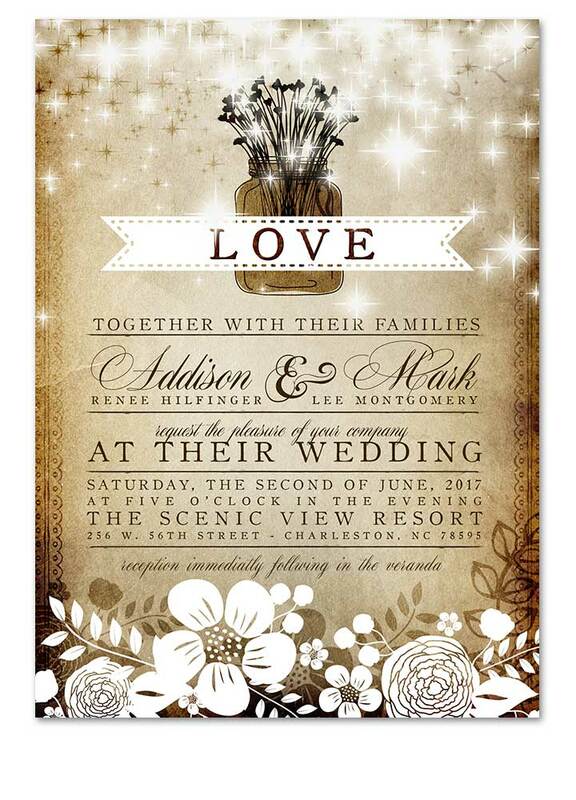 Vintage Floral Mason Jar Wedding Invitation is a great choice for those rustic weddings that want a unique and one of a kind invitation. Vintage floral peony wedding invitation. Create lasting memories in a fun whimsical style when you choose this wedding stationery. 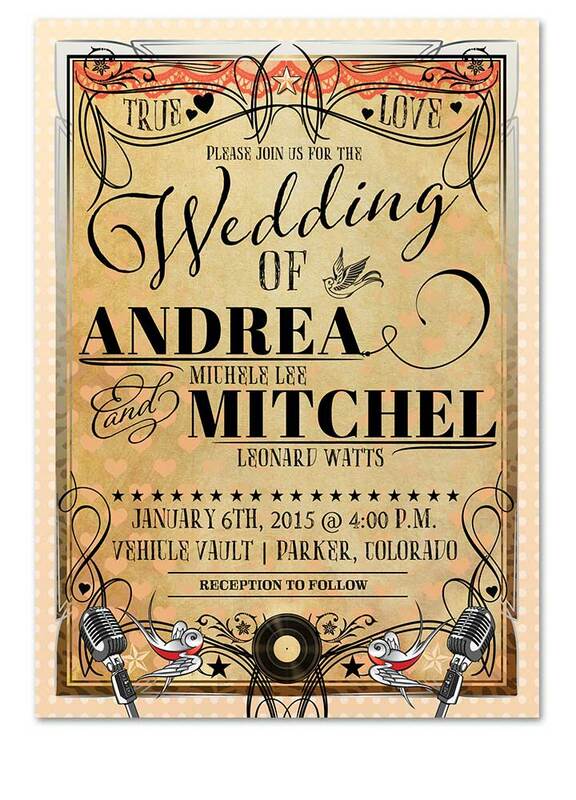 Winner of Wedding Wars Colorado, Vintage Rockabilly Wedding Invitation is sure to be a hit! This vintage 1950’s grease themed invitation is all things rockabilly in 1 invitation! 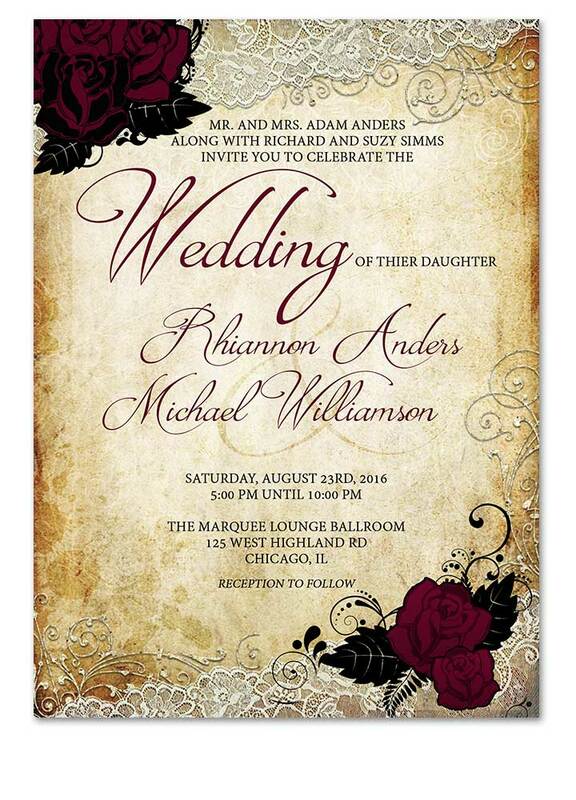 Vintage Rose Distressed Wedding Invitation. The perfect invite for your romantic wedding. 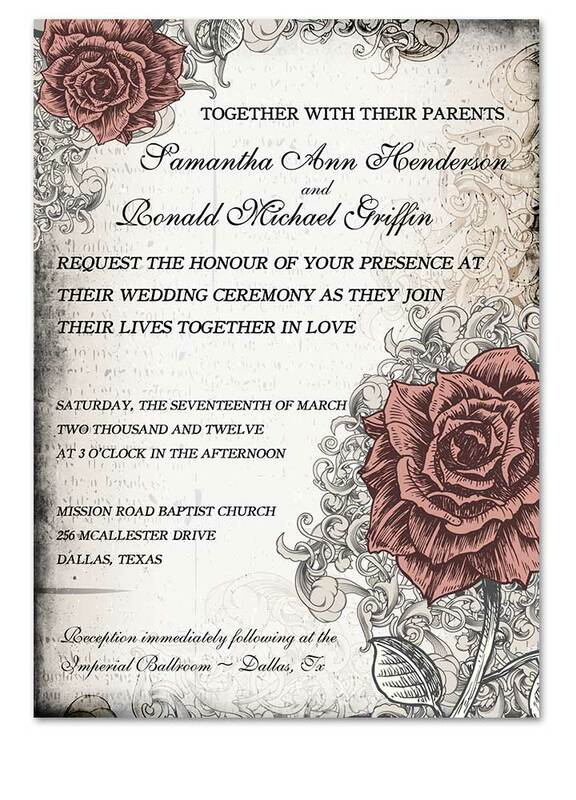 Vintage Rose Tattoo Wedding Invitation. 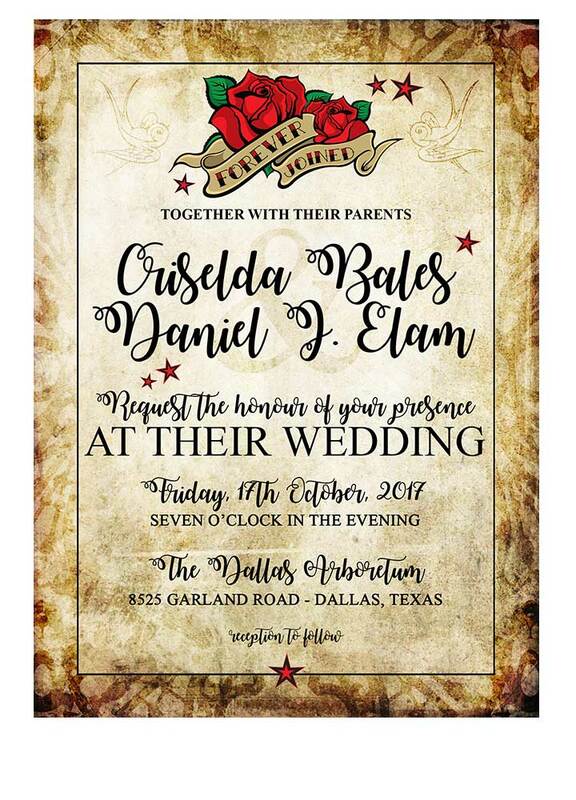 Rockabilly wedding invitations that will knock your socks off! 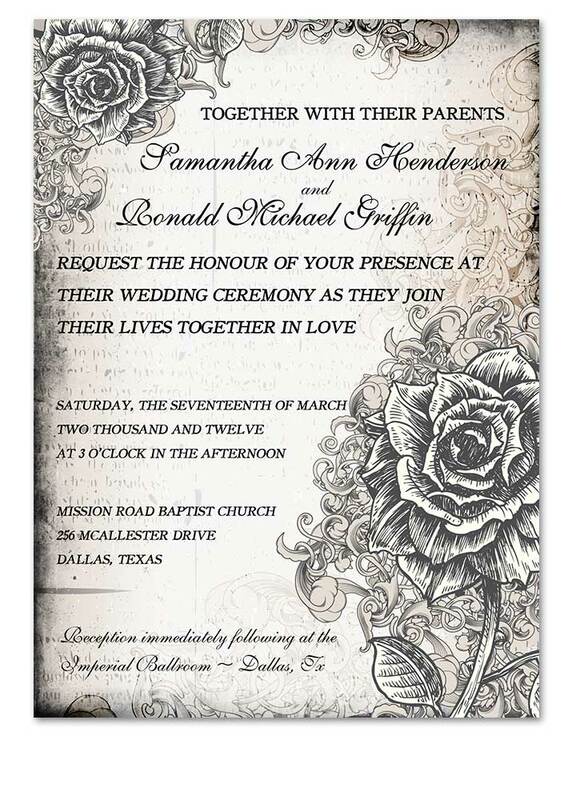 These vintage yet very retro tattoo style wedding invitations are offbeat in style and just oozing with character. 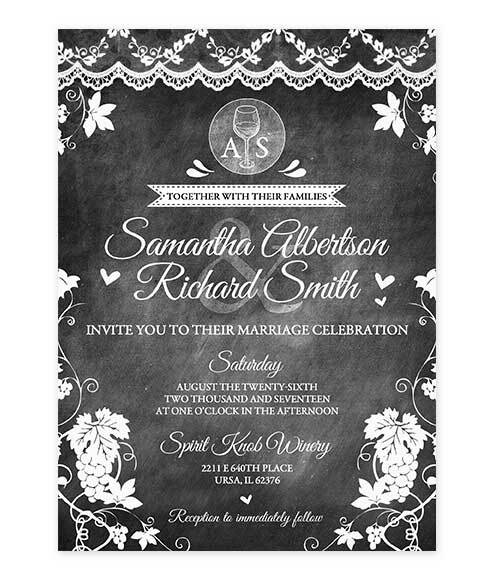 Vintage Rose Tattoo Wedding Invitation Fancy Script. 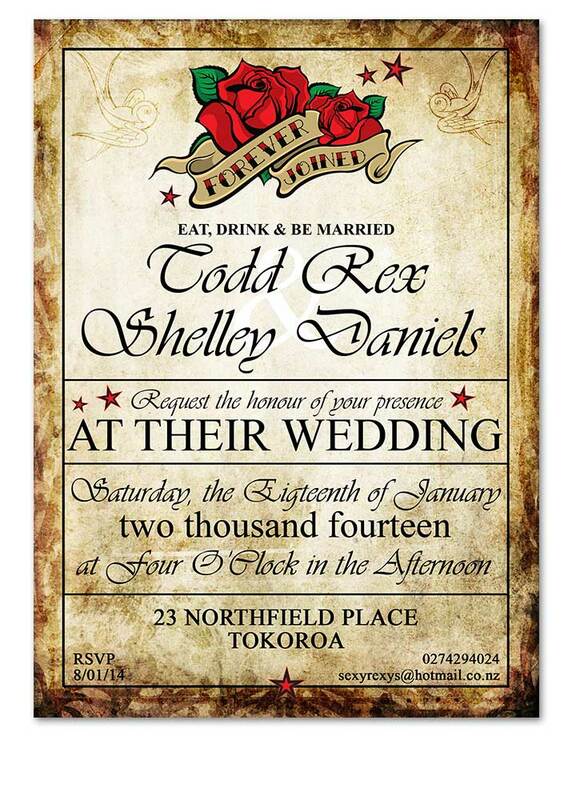 Rockabilly wedding invitations that will knock your socks off! 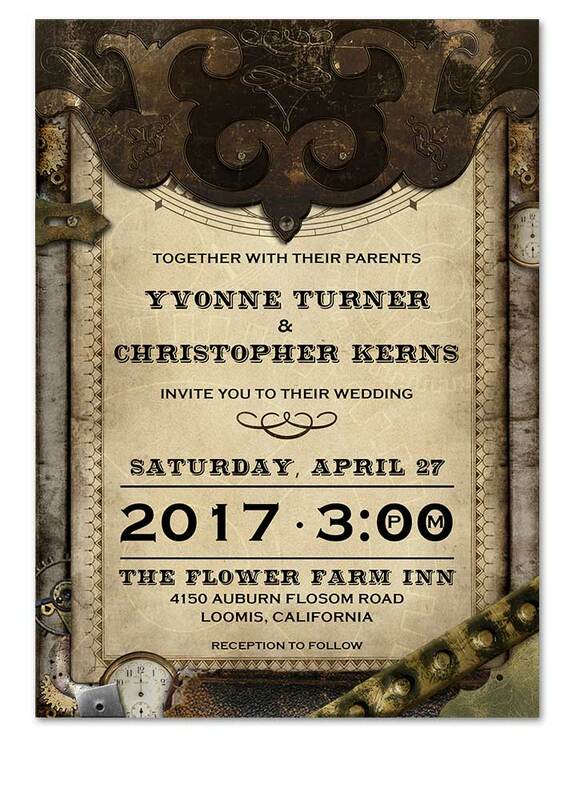 These vintage yet very retro tattoo style wedding invitations are offbeat in style and just oozing with character. Capture all the enchantment of your fairytale wedding with this storybook wedding invitation. The soft blush and cream background overlaid with ornate swirls resembles a royal scroll. 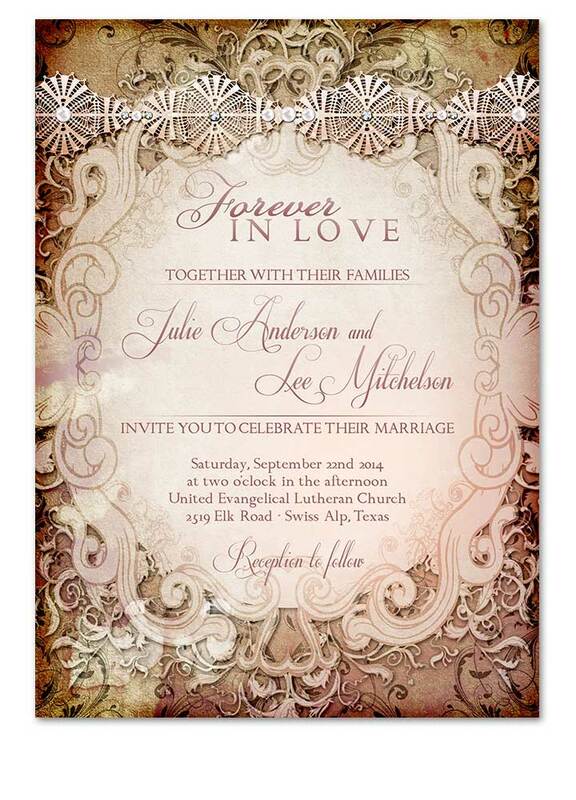 The top of the invitation is embellished with an ornate pearl and rhinestone band. 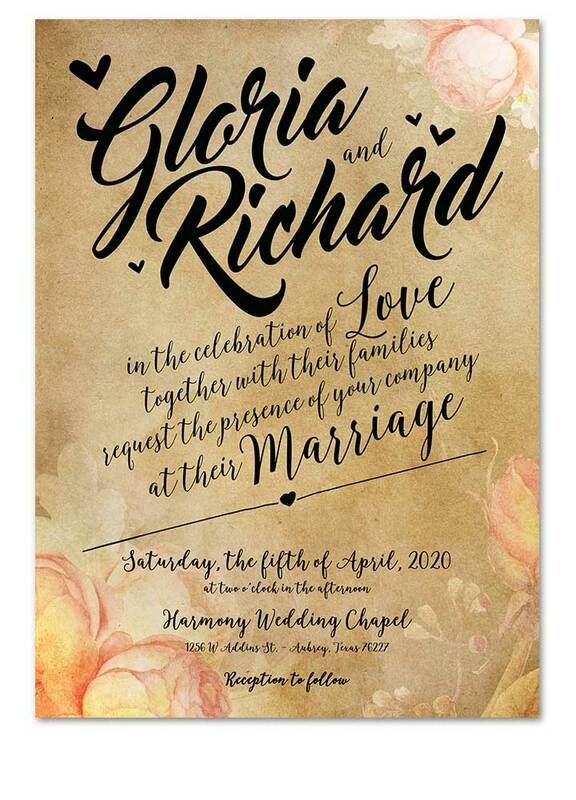 An over the top elegant invitation for your love story.